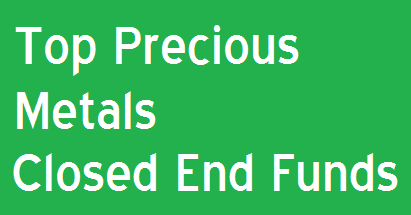 Find top performing precious metals closed end funds 2014. This best CEF funds are GAMCO Global Gold Natural Resources & Income, ASA Gold and Precious Metals, etc. Precious metals funds have been under pressured for the past 3 years. Some analysts have called the sector is in bear market. Recently, this sector has performed well. Does this sector ready to resume the bull market or is this only a bear market rally? No one will know for now, but you do need to track the top performing funds to identify the leader. Using closed end funds to invest, you can maximize the return. These funds are similar to exchange traded funds which are trading in stock exchange such as NYSE, or NASDAQ. The precious metals sector includes gold, silver, platinum, palladium, etc. You can buy these funds through your brokerage for your investment account, retirement account, etc. This GAMCO Global Gold Natural Resource & Income Trust invests mainly in equity securities issued by gold and natural resources industries and through utilizing an options strategy. The total net assets are $1.1 billion. It has a high dividend yield of 10.60%. This yield is distributed monthly. The fund sponsor is Gabelli Funds. Currently the expense fee is 1.35% per year. This top performing precious metals closed end funds 2014 has a year-to-date return of 16.01%. It has returned -6.35% over the past 1 year, 3.09% over the past 5 years, and 2.34% since its inception. The top 5 holdings are US Treasury bill 2014, Agnico-Eagle Mines, Goldcorp Inc, Newmont Mining Corporation, and Randgold Resources Ltd. The top 2 country allocations are: North America Region, and European Developed. ASA Gold and Precious Metals fund uses its assets to purchase common stocks of companies engaged in the exploration, mining or processing of precious minerals, or held as bullion or precious minerals. The current share price is $15.93. The fund manager is David J. Christensen since May 2007. The annual expense ratio fee is only 0.81%. 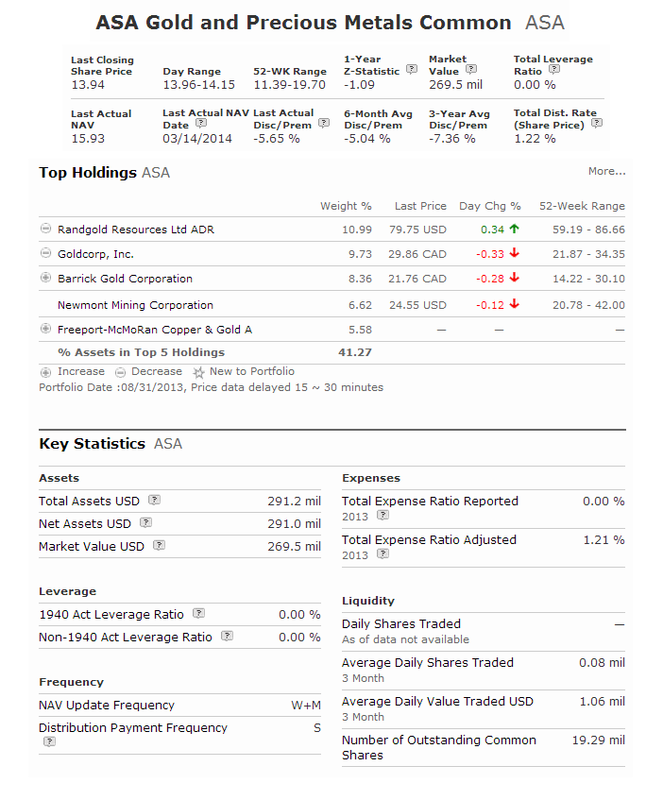 This top performing precious metals fund has 36 holdings. The top 3 sectors are mining (87%), Resources (9.6%), and ETF (3.2%). The top 5 stocks are Randgold Resources Ltd, Barrick Gold Corp, Goldcorp Inc, Freeport-McMoRan Copper & Gold, and Newmont Mining Corporation. Sprott Physical Platinum & Palladium Trust objective is to provide a convenient and exchange-traded investment alternative for investors interested in holding physical platinum and palladium bullion. The total net assets are $236 million. This top performing precious metals closed end fund is listed in NYSE Arca (SPPP) and TSX (PPT.U). The management fee is only 0.50% of NAV per year. In 2014, the year to date return is 12.90%. For the past 1 year, this platinum & palladium fund has a return of -0.51%. The share price is $9.37. The fund market price is trading at 5.34% premium to its net assets value (NAV). As of February 2014, it holds 74,379 ounces of Platinum and 169,851 ounces of Palladium.